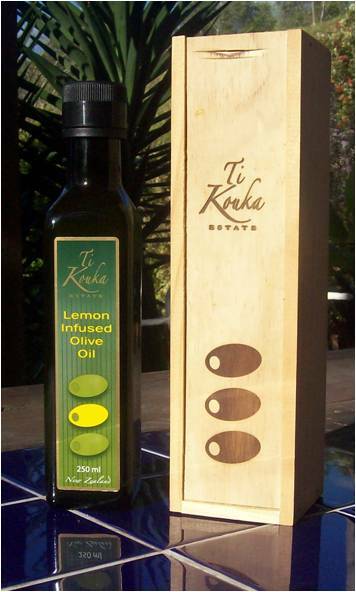 Ti Kouka Estate’s signature oil is a blend of the Greek cultivar, Koroneiki, and the Italian cultivar, Frantoio. This combines a strong full bodied flavour from the Frantoio with the fresher, slightly tangy influence of the Koroneiki. The resulting oil exhibits fruity and herbaceous flavours with a fresh peppery zing. This exquisite oil is ideally suited for serving with breads, drizzling over salads, meats, vegetables and pasta. 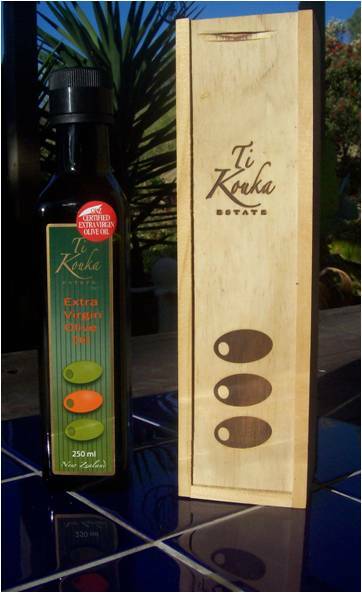 This oil is certified ‘Extra Virgin’ by Olives New Zealand and won a silver medal at the 2010 National Awards. lemons, sourced from sunny Gisborne, New Zealand, added to the Leccino and Frantoio olives as they are pressed. This process has created a crisp and tangy lemon oil which is very refreshing to the palate. Use as an invigorating compliment to dress seafood, chicken and fresh salads.